The following is a post by Stephen Most, author of Stories Make the World: Reflections on Storytelling and the Art of the Documentary. 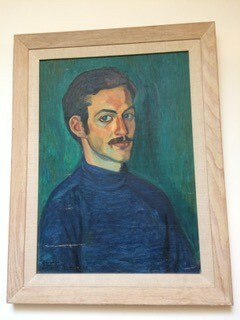 Two portraits of the young man I once was, one oil-painted, the other shaped in clay, watch over my study. More than half a century after they were made I portrayed the painter, Pedro Azabache, and the sculptor, Eduardo Calderón, in the opening chapters of Stories Make the World. My friendships with them began unexpectedly and unforgettably. As a college student I received a grant I hadn’t applied for to go to a country I knew nothing about where languages I did not understand were spoken. I had not even studied anthropology, the field in which I was supposed to do summer research. However, I did know the destination: a pueblo named Moche. My friendship with Eduardo Calderón, who taught wood and ceramic sculpture in Azabache’s school of fine arts, also began encantado, with enchantment. Calderón invited me to his adobe-walled home to make the bust that now rests on my cabinet. Soon after I got there, after he had plopped clay on a small round table and after his wife, María, served us a wooden bowl filled with chicha, a corn liquor, Calderón asked, “Do you know that I am a brujo?” I did know that word, having read, in John Gillin’s Moche, A Peruvian Coastal Community, about brujeria, which means both sorcery and its antidote, a way of healing physical and psychological maladies. On the radio a cumbia was playing as Calderón, gliding into a corner of his open-air studio, pulled the head and wings of a pelican skin over his shoulders and started dancing. Soon we were wearing the bird in turn as we danced to the catchy beat. That summer, one of Azabache’s students who spoke English, José Li Ning, helped me translate the artist’s journals. A sentence I puzzled over, learning the subjunctive, was something Azabache’s father had said to him: “I hope my son knows to make good use of his time.” Those wise words applied, I felt, to me. Li Ning also came to the first mesa, or all-night healing ceremony, I attended. As Calderón presided over a ritual the pre-Incaic Mochica sculpted on pottery a thousand years ago, I realized that I, the unlikely recipient of a grant to do ethnology, was making good use of my time. After that summer, wanting better to know my Peruvian friends and their world, I returned to the Trujillo region, starting with a two-year stint in the Peace Corps. Calderón invited me to be the godfather of his daughter Josefina, which made us compadres, friends with family bonds. Years later, his granddaughter Rosi Liliana became my second goddaughter. Decades after that, while writing the reflections on storytelling and the art of the documentary that comprise Stories Make the World, I realized: both Azabache and Calderón were storytellers. Both combined a visual medium with narrative in different forms and with different techniques than are used in documentary making. And we all moved within a current flowing from cave painting ceremonies tens of thousands of years ago and surely from visual and verbal representations of the world made long before those. I had defined myself in terms of the specific medium in which I worked, whether as a playwright, a screenwriter, or an author. Only while writing Stories Make the World did I grasp a larger identity that potentially connects every human being, for we all tell stories; our lives are shaped by them and by the stories others tell. Wanting to share memories of Azabache and Calderón with my goddaughters and other Peruvian friends, I asked Li Ning to translate the first two chapters of my book. He and his son, a professor of English, did so. Better yet, Li Ning found a magazine that will publish the Spanish version of those chapters. I’m glad my portraits of the men who portrayed me many years ago, whose friendship enriched my life, will be widely seen in their country before long. 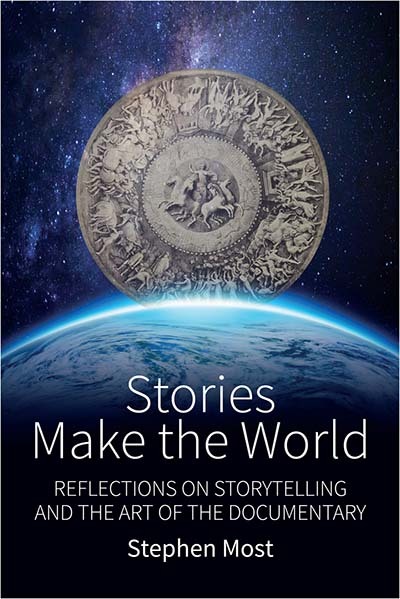 See an earlier blog post from Stephen Most here, and learn more about the book Stories Make the World: Reflections on Storytelling and the Art of the Documentary here. To stream and download films in Stories Make the World, go to www.videoproject.com/Stories. « Why do so many American Parents Struggle with Nighttime Breastfeeding and Sleep?